Farm to Camera to Table: Demystifying SLR Camera Concepts: Aperture & Shutter - Winter Supper Series - All day, hands-on, amazing locations, awesome professionals, all locally sourced meals included. 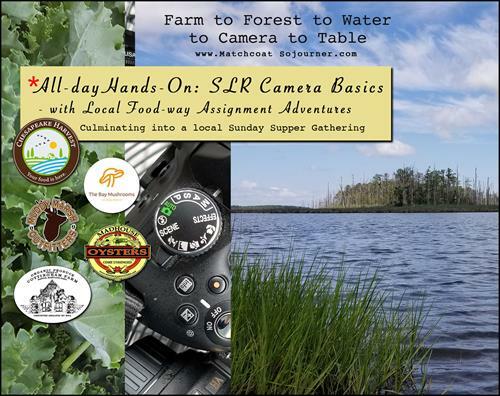 Join our professionals in truly unique environments, sprinkled with local flavor, learning the SLR camera foundations: Aperture and Shutter - While practicing you meet and tour with local producers on the water, farms, and production facilities in Dorchester County - Tasting your way through the whole journey! Evening celebration in a historic home sharing a locally harvested Sunday Supper with highly acclaimed chef, producers, instructors and classmates. Studio & Various Locations - throughout county. Schedule & Locations will be Emailed after Submitting Reservations. All day 9 a.m. through 7 p.m.
$325 - Includes: All day, hands-on, amazing locations, awesome professionals, all locally sourced meals included. **Participants need a sense humor, taste for adventure ….SLR camera body, one lens, tripod & a full tank of gas!